Julia Butterfly Hill brought international attention to the plight of the world’s last remaining ancient forests when she climbed 180 feet into the branches of a 1000 year-old redwood tree and refused to come down. 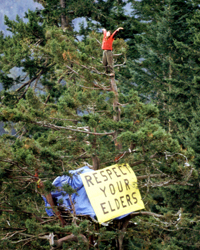 Her historic protest to the environmental destruction caused by the clear-cutting of ancient redwoods culminated after 738 days with an agreement that provided permanent protection for the tree known as Luna and the grove around it. Julia Butterfly Hill is an activist, writer and poet. She is the author of the national best seller The Legacy of Luna; co-author of One Makes The Difference; and Becoming—poems, pictures, and short stories. The audio release, Spiritual Activation, captures Julia’s vital message as it is given at standing-room-only appearances across the country. All of Julia’s books (and the packaging for the CD) have been published with 100% post-consumer recycled paper with soy-based inks and chlorine-free processing, pushing the publishing industry to a higher standard of ecological sustainability.